It is the summer of 1940 and things have been pretty normal even though England has been at war for almost a year now. When the war first broke out many of the children in Edie’s neighbourhood were evacuated into the countryside but now many of them are back at home with their families. Now everyone is talking about a possible German invasion. Edie and her family have only just completed their Andersen shelter when the Germans start to bomb London. Night after night the family spends hours in the shelter hoping that their home will be spared and that no one they know has been harmed by the shower of bombs hitting the city. Night after night Edie’s father goes out to fight fires and to rescue as many people as possible who are trapped inside collapsed buildings. It is terrible, exhausting time and though she said she would never do it Edie’s mother decides that she has to send Edie and her little brother away from London. 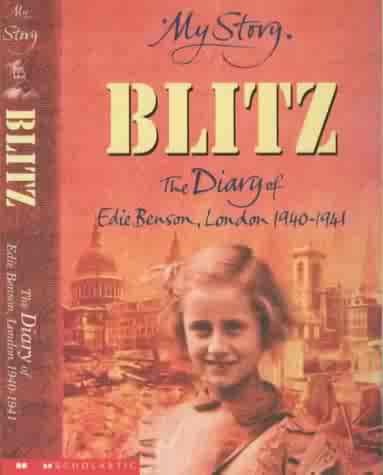 Though the Blitz is terrible, to Edie and her brother living in the home of Mr. and Mrs. James in Wales seems infinitely worse. The dreadful couple make the children feel unwanted and homesick and the children at the local school are almost as bad. If only they could go home to be with Mum and Dad again - at least the family would be together. This engaging story about a young girl’s experience in England during World War II is both funny and shocking. On the one hand there is a perfectly ordinary family trying to get on with their lives and on the other there is the war which seems to be trying to tear their lives apart. It is possible to see how courageous and determined the Londoners were in the face of so much horror and to appreciate how much they sacrificed.